Backstage behind a thin bamboo screen, around 20 puppeteers slosh around waist-deep in rubber overalls wielding the marionettes with long rods. "The puppets are pretty heavy... and the water also creates resistance," said puppeteer Nguyen Thu Hoai, who swapped her galoshes for flip-flops between sold-out shows. "But our years of training and experience helps us control them," added Hoai, who like many of her colleagues graduated from Hanoi's College of Theatre and Cinema. Some of the puppets weigh as much as 10 kilogrammes (22 pounds) and the largest ones, like the one-metre-tall (three-foot) fairy, require four people to manipulate. The shows at Hanoi's Thang Long theatre have become a staple on the well-trodden tourist circuit and draw thousands every week, including many first-time viewers. "I've never seen a puppet show that way with the water," American tourist Caroline Thomoff told AFP after a show. "I could really see people fishing, dancing and all the different performances that happened." Vietnam is the birthplace of the centuries-old art form that emerged in the northern rice paddies as entertainment for farmers. The earliest record of the performances is on a 12th century stele that still stands at a pagoda in northern Ha Nam province, but historians say water puppetry likely originated even earlier. The shows traditionally featured age-old fables and mythical lore, like the famous Hanoi parable about a Vietnamese king's treasured sword that was used to fight off Chinese invaders. The tropes haven't changed much, and neither have the hand-carved wooden figures of animals, boats, farmers or fish painted in brilliant golds, reds and greens, according to Chu Luong, the director of Thang Long theatre. "When our children and later generations see performances they will be just like the original versions," he told AFP. Despite its ancient roots -- or perhaps because of them -- the shows draw little attention from local Vietnamese viewers, especially millennials. More than half of Vietnam's 93 million people are under 30 and often prefer their entertainment in digital form. 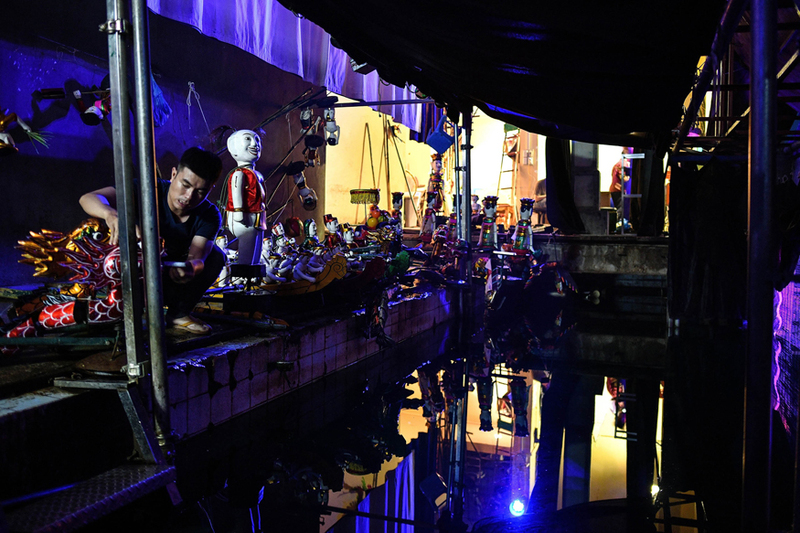 "There are new types of entertainment now, electronic devices and the internet, so apart from festivals we can't perform all the time because (local) people don't watch a lot," said Pham Dinh Viem, a third-generation puppet carver from a craft village in Thai Binh province. Like other puppet craftsmen in the village, Viem doesn't earn enough to support his family making the marionettes so he picks up work on the side as a manual labourer. But he perseveres, hopeful the next generation might pick up a passion he says runs in his blood. Yet as interest wanes at home, there are signs water puppetry may be gaining traction abroad. Canadian Director Robert Lepage returned to Toronto this year with an adaptation of Stravinsky's opera "The Nightingale", in which the orchestra pit was transformed into a pool of water for singers-come-puppeteers commanding marionettes. For puppetmaker Viem, such innovative approaches may be the secret to reviving the centuries-old tradition among locals. "If the script and the performance don't change, it's impossible to serve the audience in the long-term," he said.